With due respect to Classicists, I do not subscribe to the poor paganism take on Greek archaeology. This involves on-site complaints about how the intolerant Christians spoliated pagan temples to build churches, complete with the rending of one's sweat-proof sport garment and pounding one's chest with in-reach archaeological remains. As I've reported before, one should dutifully visit pagan sites, and do so with respect. Paganism posited the greatest questions imaginable; but the problem is, those questions were answered. Accordingly, Theodosius did not forcefully shut down Delphi as much as he put it out of its misery, the oracle having been in decline for centuries. Likewise, the site of Olympia was not as heavy-handedly suppressed as Ol' Yeller was taken out back to be put down. Call it a form of architectural euthanasia. medieval churches, monasteries, mosques, castles and villages were still considered unworthy of archaeological attention... Such buildings were seen as stylistically decadent, vaguely Islamic and hence uncivilized. Simply put, archaeology as we know it is founded upon "widespread academic disdain for medieval monuments." 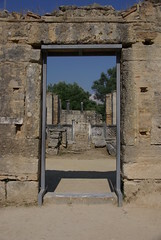 At Olympia, for example, "any postclassical remains that interfered with the experience of antiquity were destroyed." My visit to Olympia this week confirmed that reality. Though it's obvious to any observant visitor, one has to dig pretty deep in a guidebook to find the fact that the Phydias' workshop is now actually a church. And when guidebooks do say so, they often report the fact with a tone of regret. But is it not profoundly fascinating that the place that manufactured perhaps the greatest sculpture ever made - the chrysoelephantine statue of Zeus - later functioned as a eucharistic landing pad for the real presence of the God of Abraham, Isaac and Jacob? If that's too much to concede, at the very lease let's ascribe to early Christians the compliment that, considering our culture's virtue barometer, should inevitably send their status skyward: They recycled.